Boston. Beantown. “The Town.” My hometown. I love Boston. I’m probably biased since I grew up here, but I think it’s one of the most underappreciated cities in the entire country and one of the best destinations. It’s just a wonderful, friendly place to live and visit! The history, the food, the sports, the community. Boston is like a big small town. And all the college students here help give the city a permanent youthful energy! But what are the best places to stay? Well, that depends on a lot of factors. 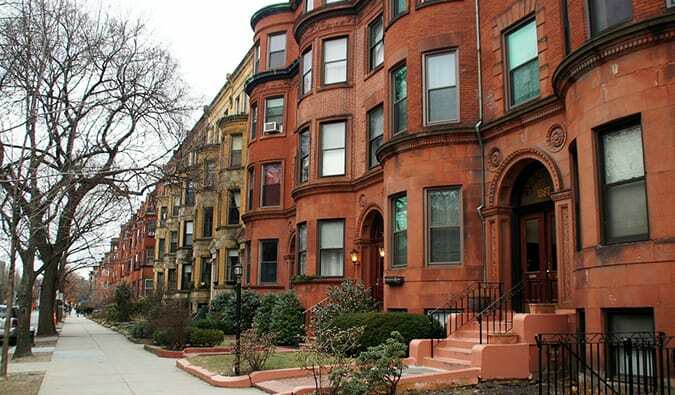 The Back Bay is one of the most beautiful (and upscale) neighborhoods in town. 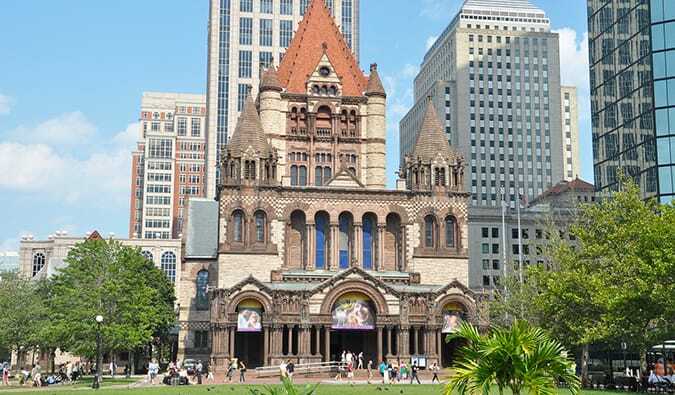 It includes the happening Copley Square (home to the Boston Public Library and Trinity Church and the shops at Copley Place), as well as the beautiful homes on the surrounding streets near the river and the shops and restaurants on Newbury and Boylston Streets. Fun tip: There’s a farmers market in Copley Square on Tuesday and Friday afternoons. BUDGET: Garrison Street Apartment – It’s hard to find a super cheap place to say in this neighborhood. This is as close as it gets. In a historic brick building, these beautiful serviced apartments are just like staying in Airbnb and come with all the amenities of home. There’s also a beautiful rooftop. MID-RANGE: Boston Copley House – Copley House is actually a set of studio apartments located in traditional brick row houses, each with fully equipped kitchens and cable TV. The building also has a beautiful rooftop. – This is easily one of the most luxurious hotels in the city! It’s located near Newbury Street with its busy restaurant and shopping scene, but the hotel’s OAK Long Bar + Kitchen is an excellent dining option. If you’re staying on the concierge floor, you’ll get free continental breakfast and evening hors d’oeuvres. There’s a rooftop health club and outdoor deck. 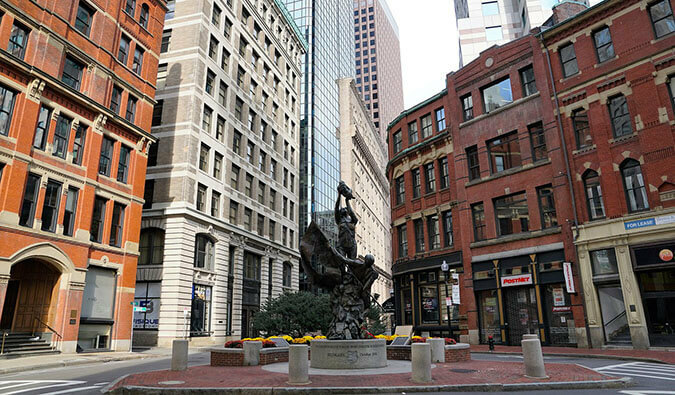 Downtown is Boston’s commercial and financial center. It’s one of the oldest parts of town, a maze of cobblestone streets and historic buildings against a backdrop of giant modern skyscrapers. The area has really become “hot” the last few years (it was run-down when I was growing up here), and you’ll find tons of hip cocktail bars and restaurants here. 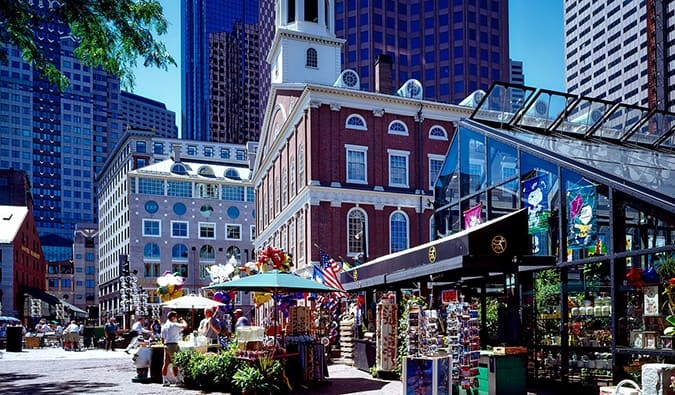 And there are lots of tourist attractions that make up a section of the Freedom Trail (for example, the Old South Meeting House, Faneuil Hall, and the Old State House). Plus, it’s right next to Chinatown (good food) and the Commons (the city’s main park). 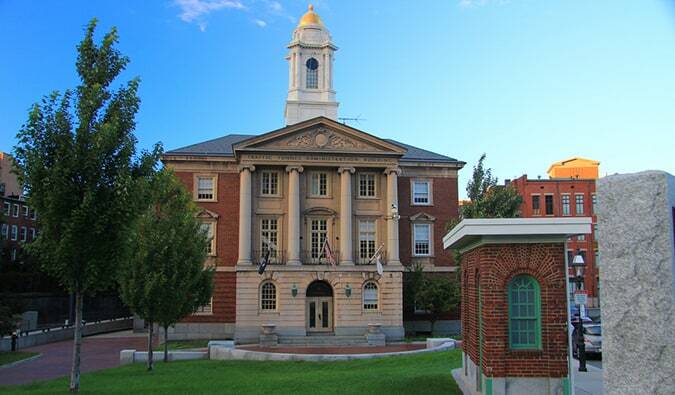 BUDGET #1: Hostelling International Boston – The HI Boston is one of the best in the HI chain. It only opened six years ago, so it’s still pretty new. It has a kitchen and common area as well as rooms for meetings. The beds come with a personal shelf, a reading light, and power outlets. It’s the best hostel in Boston! BUDGET #2: Found Hotel Boston Commons – This hotel offers dorm rooms in addition to privates, so it’s a great option if you’re on a budget. You’ll get a bunk bed with a curtain for privacy and your own locker. The private rooms are pretty small, but they’re clean and newly renovated and come with a desk. I love all the wood finishings throughout the building. MID-RANGE: The Godfrey Hotel Boston – This boutique hotel has a stylish lobby as well as a fun bar serving up delicious drinks. The rooms have everything you need, including a desk area and lots of natural light. LUXURY: The Langham – This is a traditional-style hotel with a gorgeous ballroom; a chocolate bar on Saturdays in Café Fleuri; huge, opulent rooms with super plush beds and pillows; an incredible staff; and a grand entranceway. It’s a splurge! BUDGET: The Farrington Inn – This small guesthouse also has dorm rooms, making it one of the most affordable options in the area. All the rooms are air-conditioned, and some come with kitchenettes. There’s free Wi-Fi too. MID-RANGE: Studio Allston Hotel Boston – This ultra-artsy hotel appeals to young travelers, who like making use of the common areas and the outdoor patio (complete with a rum bar). Each room comes with its own unique artwork! It’s fun place to stay, even if the rooms are kind of small. LUXURY: AC Hotel by Marriott Boston Cleveland Circle – This hotel has convenient access to the whole city via the MBTA Green Line. It’s home to a nice business center and a 24-hour fitness center as well. It’s your standard chain hotel, really, but I like it for the location and lounge. This area is home to the Red Sox and Fenway Park. However, Fenway is also one of the most academic and cultural districts, with nearly a dozen colleges and universities located nearby. In recent years, it’s become the yuppie capital of the city, and tons of new condos and restaurants have opened up. It’s a nightlife mecca, especially at the clubs and bars along Lansdowne Street. Nearby, there’s Kenmore Square, where you’ll find some pretty great museums, like the Museum of Fine Arts and Symphony Hall. BUDGET: Residence Inn by Marriott Boston Back Bay/Fenway – This is an extended-stay hotel near Fenway Park, with studio, one-bedroom, and two-bedroom suites. Each one has a kitchenette where you can save money by cooking at home rather than eating out. 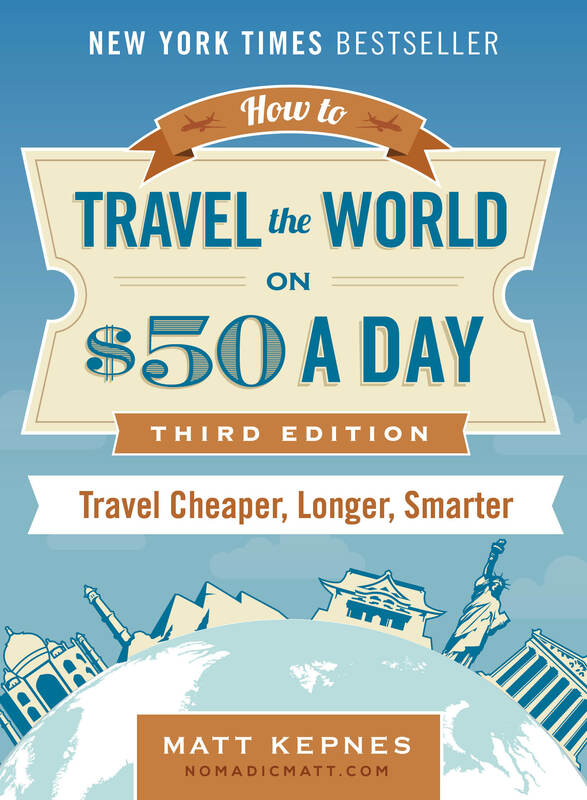 Perfect for when you’re traveling with groups! MID-RANGE: The Verb – This might be the hippest place to stay in Boston’s city center, complete with a large vinyl library exclusively for guests. There’s definitely a party vibe around the pool in the summer. It has wonderful rooms with natural light, art, and modern fixtures; free Wi-Fi; and a fantastic fitness center. 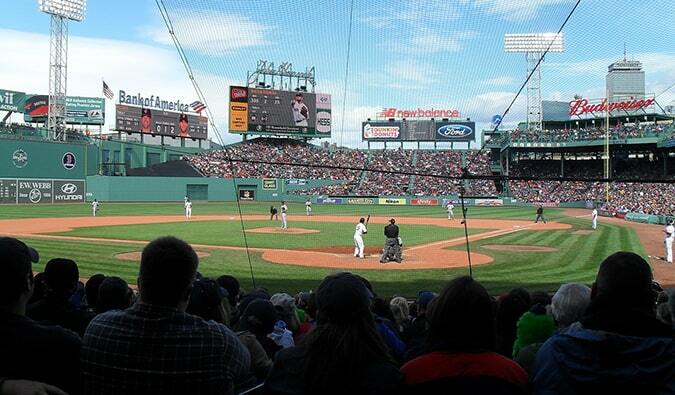 LUXURY: Hotel Commonwealth – This swanky spot is the official hotel of the Boston Red Sox. The rooms are modern and ultra-luxurious, with plush covers and usually a couch. The on-site restaurant is the swanky Eastern Standard. The hotel also has a great lounge overlooking the city. The North End neighborhood is Boston’s oldest and is commonly referred to as “Little Italy,” since it’s where all the Italian immigrants in the 19th century settled (as such, it has the best Italian food in town). This waterfront community has cobblestone streets and plenty of good reasons to visit, including the Paul Revere House and Christ (Old North) Church (with the oldest set of ringing bells in North America). MID-RANGE: Battery Wharf Hotel – This place isn’t exactly budget, but the North End doesn’t really do budget. The rooms come with large TVs, free Wi-Fi, and impressively comfortable beds. The Aragosta Bar and Bistro serves a fantastic Italian breakfast, and the lobby lounge does cocktails and candy (seriously). Even better: the spa is top-notch. LUXURY: Boston Yacht Haven – If you want a room with a view, this is it. The Boston Yacht Haven is right on the water, and it even has its own marina (where you’ll definitely see a few super yachts around). The rooms are crazy posh, and if you can, request one with a harbor view and balcony. There’s free breakfast; other perks include free Wi-Fi, board games, and an in-room microwave and fridge. 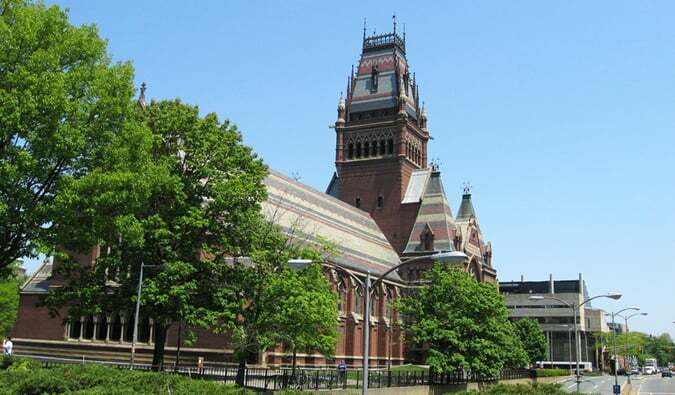 Home to Harvard and MIT, Cambridge is a quintessential college town across the Charles River from Boston. With its grassy parks and tidy town squares, it might seem like a quiet place, but there’s a great arts scene, plenty of museums, and lots of live music. There’s a restaurant for every taste, and I think it’s one of the most culturally diverse parts of the city. This is the hip spot to be. BUDGET: Irving House at Harvard – This is more a B&B than anything else, with a cute and cozy atmosphere; rooms with comfy beds, a desk, and couches; a shared kitchen space; and on-site laundry facilities. It’s a peaceful place to stay. MID-RANGE: Porter Square Hotel – Near Harvard and MIT, Porter Square Hotel has a lovely patio and garden during the summer months. Other than that, it’s a pretty standard hotel, with spacious rooms and lots of natural light. It’s clean, has friendly staff, and is one of the more affordable hotels in the area. LUXURY: The Kendall Hotel – This gorgeous Victorian-style boutique hotel was built in 1894 and is located next to the MIT campus. Each room is decorated individually with unique art. The beds are wonderfully soft. The breakfast buffet is great, and there’s a “wine hour” each night on the rooftop. Splurge here! When I grew up, there was nothing here but the Children’s Museum and a lot of empty space. 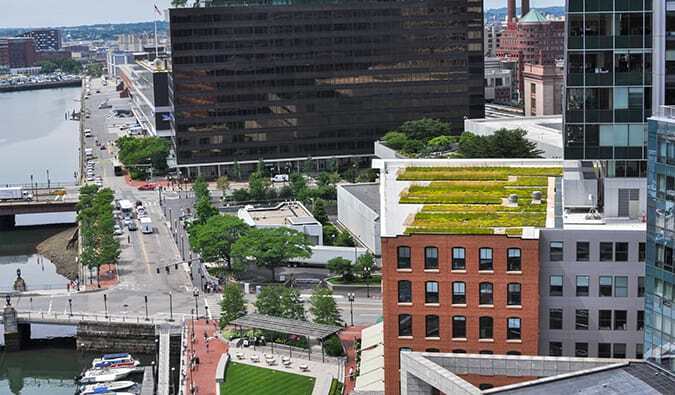 Now it’s one of the coolest parts of town, with tons of condos, high-end restaurants, fancy cocktail lounges, museums, the awesome outdoor space Lawn on D, and the Harpoon Brewery. Every time I come back here, I’m just shocked by the change that’s happened! BUDGET: Staypineapple at the Alise Boston – A trendy spot for young travelers, the Staypineapple has a lot of fun perks, like dog-friendly rooms and bicycle rentals. Fluffy towels and bathrobes are a nice touch. MID-RANGE: Encore Bed & Breakfast – Every contemporary room at this B&B has wonderful views of Boston’s skyline, as well as queen-sized beds and great in-room sound systems. A nice breakfast with fresh pastries and coffee is served each morning! Free Wi-Fi. LUXURY: Aloft Boston Seaport District – Aloft hotels are always a good idea, and this one is no exception. All rooms have their signature beds and large walk-in showers, and the WXYZ Bar is an awesome spot to grab an evening drink. Brookline is a big town, but part of it abuts Boston, and that area has a quiet, small-town feel. It’s not overly touristy, mostly a residential area with quiet streets and brick apartment buildings. 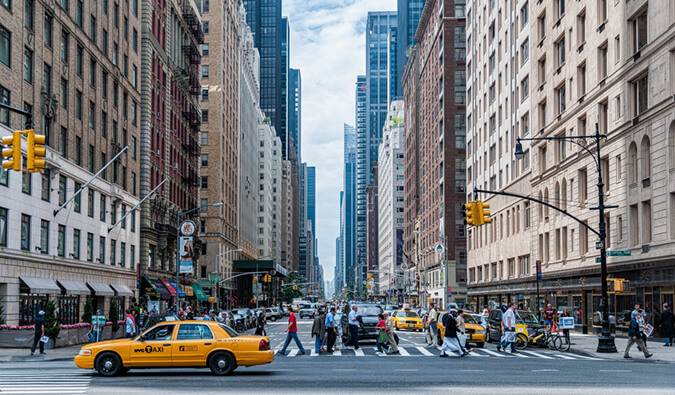 Walk around and visit the many small shops and cafés, or grab lunch at one of the many amazing restaurants (like yummy quesadillas at El Centro). 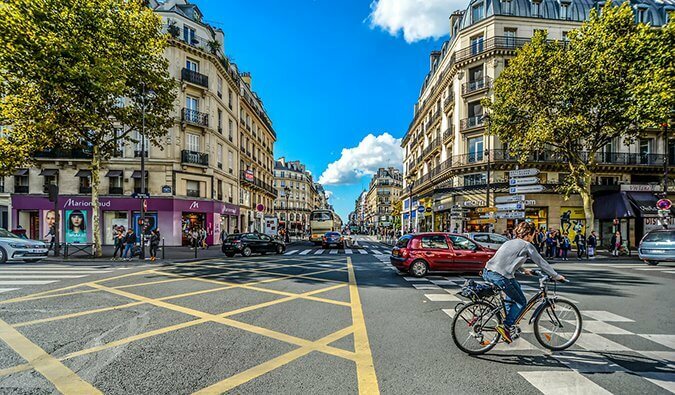 There’s a T (metro) line that runs through the area, so it’s easy to get downtown! BUDGET: Coolidge Corner Guest House – This little place is a gem! It’s in a quiet neighborhood, it’s comfortable, and the owners are friendly. The rooms have very traditional décor, and they are all different. It includes free breakfast too. MID-RANGE: Courtyard by Marriott Boston Brookline – All the rooms at the Courtyard come with a work desk, a nice seating area complete with a sofa, and a coffee maker. The fitness center has cardio machines and free weights. LUXURY: The Bertram Inn – This small inn has just 14 rooms. Each room is different: some are decorated with fancy beds (even with old-fashioned bed posts), curtains, and luxury leather chairs. Others are simple and floral. But they are all “old school” and antique. It’s super cozy…and super luxurious. The hotel also has massage services on-site and free Wi-Fi, as well as a lovely patio overlooking the garden. Boston is one of the best cities in the country! 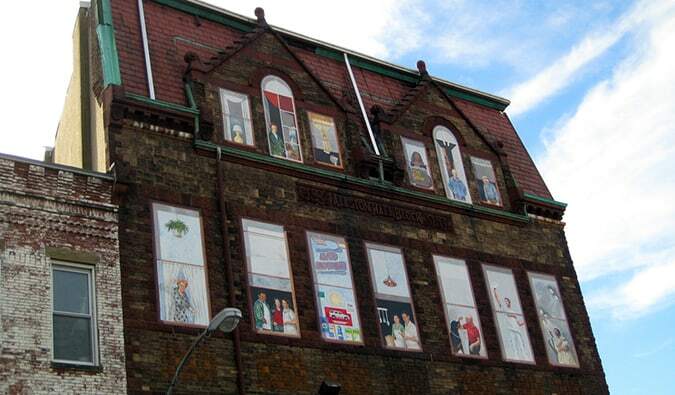 Not only does it have picturesque neighborhoods and top-notch dining and bars but it is steeped in history. One of the things I love so much about Boston is that, for one of the biggest cities in the country, each neighborhood has its own small-town feel so you don’t feel like you’re in a giant metropolis. There’s also a ton of free things to do in Boston, so it won’t hit your wallet hard. You can book your hostel with Hostelworld. If you want to stay somewhere other than a hostel, use Booking.com, as it consistently returns the cheapest rates for guesthouses and cheap hotels. I use it all the time. Check out my in-depth destination guide to Boston with more tips on what to see and do, costs, ways to save, and much, much more! Thanks, I needed this today (literally)! I’m going to Boston in May and have been struggling with where to stay. Just booked at Coolidge Corner. Be sure to eat at Zaftigs. Best brunch in the city. The lox is amazing!